C.H.I.L.D.Haus or the Center for Health Improvement and Life Development Haus has now grown from its humble beginnings in its very first center located on Quezon Institute Compound. Its center, which is the first and only temporary home for children with cancer is now a seven-story multi-purpose complex located on Agoncillo Street in Paco, Manila. Through the initiative of the Ricky Reyes Foundation, CHILD Haus was created to provide respite for cancer-stricken children from the provinces who are in need of financial support for their treatments and home to stay. It was through the efforts of philanthropist, Ricky Reyes that CHILD Haus was able to extend a helping and healing hand to children with cancer from allover the Philippines. 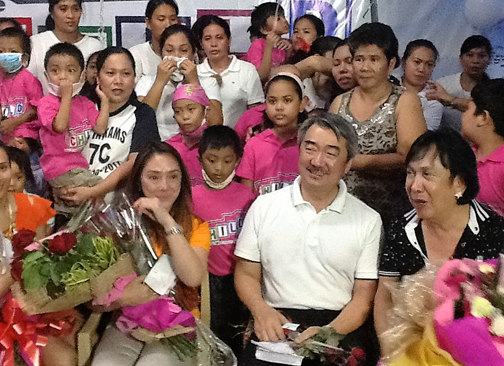 Mother Ricky credits the continued success of CHILD Haus to the never-ending kindness and generosity of their various donors and benefactors, most especially to SM Holdings Inc. President,Hans Sy. CHILD Haus has found a home in Paco, Manila all thanks to Hans Sy or “Kuya Hans ng CHILD Haus.” It was on Mr. Sy’s 60th birthday in 2015 that he decided to build a bigger and better home for the children of CHILD Haus. Instead of opting to buy material things for himself on his birthday, he wanted to do something to help other people in need. The construction of the CHILD Haus complex is the result of Kuya Hans’ love, understanding, and support for these sick children. 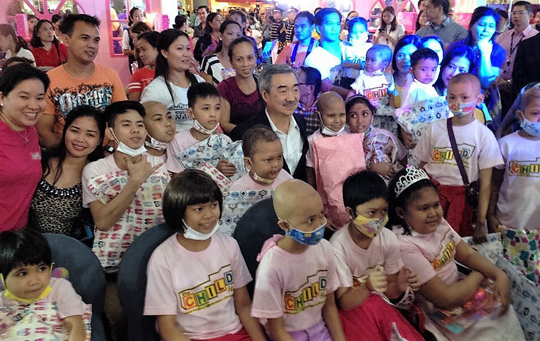 It is also a tribute of his love and respect to his father, Henry Sy, Sr.
For over 15 years now, CHILD Haus has provided a home for children diagnosed with cancer. Nineteen-year-old Ronalyn R. Bataller from Alban, Bicol is one of the many residents of CHILD Haus. She was orphaned at just four years old and was left to take care of her two younger siblings. Their home was lost in 2015 because of the damage brought by Bagyong Reming. To be able to provide for her siblings, Ronalyn started joining barangay pageants and doing housework for her relatives. At just sixteen years ord, she was operated on and had her right ovary and appendix removed. She was also diagnosed with having mixed germ cell tumor and given only six months left to live. Refusing to give up, Ronalyn then traveled to Manila to seek another doctor’s opinion on her illness. It was through her Manila doctor’s referral CHILD Haus that Ronalyn was able to undergo treatment. She has now returned ta her home in Albay to complete her road to recovery and reunite with her siblings. Baby Richard Moreno, also a CHILD Haus resident from Bicol, was only three months old when he was diagnosed with having liver cancer. His mother sought out help for his treatment from one hospital to another until they came to Philippine Children’s Medical Center or PCMC. They were referred to CHILD Haus for shelter and treatment for Baby Richard. After several months at CHILD Haus, Baby Richard’s surgery will now push through thanks to the numerous kind-hearted donors especially Mayor Sandy Javier of Javier Town of Leyte. Baby Richard is currently confined at Max Super Specialty Hospital in New Delhi, India awaiting his liver transplant.